Far to often we hear about cargo trailer accidents and mishaps across the country. At Shore 2 Shore Trailers, our wish is for of our customers to experience safe travels while towing their trailers. Towing a trailer is a huge responsibility. Here are a few quick safety tips for towing a trailer. Speeding is a leading cause for cargo trailer accidents. Remember when pulling a trailer, there is more weight that has to be stopped, which will take more time. Driving slower will not only give you more time to react, but will allow braking to be smoother. Cell phones, texting while driving, and computer screens in your vehicles take your eyes off the road and is proven to be very dangerous. In fact, many studies have shown that texting and driving is as dangerous if not more so than drinking and driving. As a rule, if you need to use your cell phone pull over and don’t take the risk. Keeping your mind on the road is always of upmost importance. Did you know your trailer can only handle a certain amount of weight? Not all trailers are equal. Not knowing your trailer’s weight capacity can lead to big problems. Before loading your trailer, check with the manufacturer’s guide on it’s maximum weight capacity or ask one of our qualified professionals to help you. Mirrors are so very important. After all, not being able to see the end of your trailer or what’s behind you, can be a big hazard. Therefore, make sure your vehicle has towing mirrors to get the full view around you. First of all, one of the most overlooked components of trailer maintenance are tires. When trailers aren’t used as often as your tow vehicle, the tires can be susceptible to dry rot. Also, tires can become worn from improper load bearing. Too much weight, under inflated tires, unbalanced load and even general road conditions can ruin tires in no time. Tires that are not properly inflated are a disaster waiting to happen. Check your trailer’s tire pressure to make sure they are properly inflated. If your enclosed trailer is equipped with a brake system, then you should have these checked on occasion. Inspections can skip costly repairs in the future and eliminate down time. By law all trailers are required to display brake and turn signal lights. Remember to check your connections and make sure the lights work properly before hitting the open road. Many parts stores carry bulbs if you need a replacement. Need More Information On Enclosed Trailers? 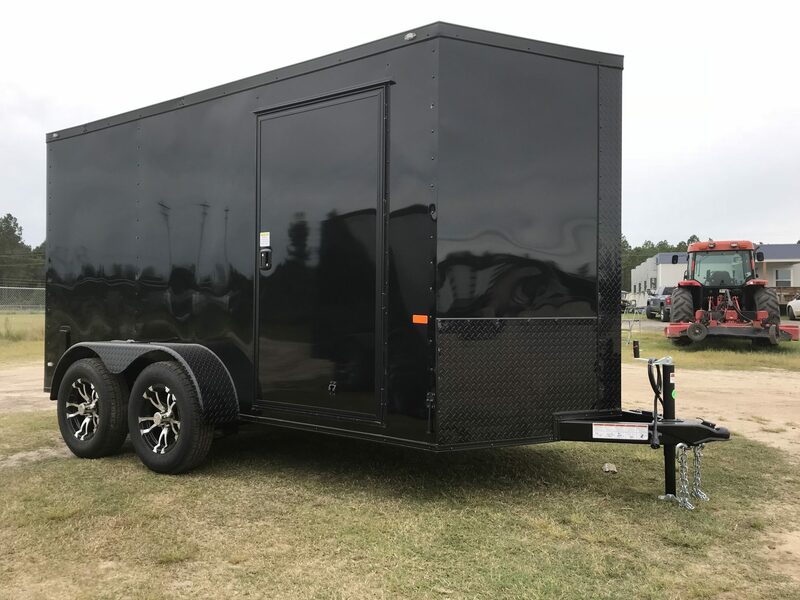 For more information about our Enclosed Cargo Trailers For Sale, Contact Us here, or you can call our team of professionals today at 1-844-732-2746. Our staff is ready to help answer any questions or concerns you may have about purchasing an enclosed cargo trailer. We can’t wait to hear from you!